Family game night? Backyard BBQ with some friends? Whatever the occasion, Double Nine Dominoes can add fun and bring people together. 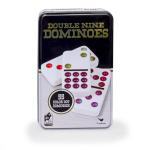 This set includes 55 durable, ivory-colored, plastic dominoes that stack neatly in a convenient storage tin. Players pick seven tiles at random and try to match them to the tiles in play. The first player to place all of their tiles wins. Learn to play 16 different ways with the included instructions.